Tonight saw me visiting a venue I’ve not been to before, the House of vans, which turns out to be in an arch under the railway a minutes walk from Waterloo station. The band that brought me here is Australian rock band The Lazys. I’d checked them out on Youtube and they sounded good – good enough in fact for me to come and see them play live rather than seeing one of my favourite artists (Doro) at the underworld. There was an interesting crowd – far more hipsters and wannabe skater types than a typical rock gig, but as I was about to find out, the support acts were very different musically. First up was The Standstills. My intitial thought was that they’d seen the White Stripes and thought it was a good idea to form their own two-piece band with a female drummer and a male guitarist/singer. Sadly they aren’t as good as the white stripes and just came across as a fairly average pub band. Then things got worse as the second band, Fizzy Blood, took to the stage. After an ok start with a song that sounded fairly good, it quickly degenerated to the stage I was considering taking up smoking to get a break from their music. Thankfully though it was a reasonably short set. Finally it was time for The Lazys. It didnt take long for them to make me forget the first two bands as they kicked off an hour-long set with some great Aussie rock. Let’s start with the obvious bit – unlike Airbourne, they don’t sound like ACDC, but they do have that distinctive Aussie rock feel to their music. It’s the sort of music that is just feel-good party music that’s perfect to drink beer and have fun to. It’s high energy music and the band burn off a lot of energy too with their headbanging on stage meaning anyone standing too close is likely to be whipped with the flying hair. 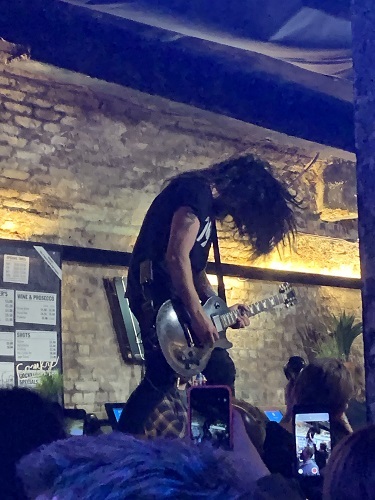 Guitarist Matty Morris has obviously taken some inspiration from fellow Aussies Airbourne as at one point he leaves the stage and heads out into the crowd before climbing onto the bar to carry on playing. It’s a great performance from The Lazys who will be back later in the year to play Ramblin Man and Bloodstock festivals and I definitely hope to catch their performances at both. A great band to keep an eye out for.